Moonlighter, the rogue-like action RPG from Digital Sun Games, has received a heap of new content and best of all – it’s completely free! Officially titled “Friends & Foes”, the update packs in a whole host of changes and additions to the game. Most notably, companions and brand new minibosses are now available. There are now nine companions to help you on your quest through the various dungeons in Moonlighter. Each familiar sports a different set of skills and could potentially damage enemies, restore health, fetch items, or provide additional storage. Obtaining a companion requires you to kill a particular enemy ten times. On the tenth time, a special egg will appear for you to collect. Give it a few days, and once hatched you’ll have a fresh familiar to take dungeon crawling with you. Eight new minibosses now available. Covering the “Foes” side of the update is the inclusion of eight new minibosses. These new challengers appear in the final room of the first and second floors of each dungeon. You’ll need to take them down in order to progress to the final level. Of course, your new companion will be there to help should you need some extra assistance. Digital Sun Games also included a bunch of quality-of-life changes. There’s now better a way to sort and organise your inventory, a new system in the shop to let you know when an item’s price is updated, some UI tweaks and warnings to make investments with the Banker easier, and if you somehow lost the Broom, it can now be purchased again from Le Retailer. Alongside all of this, the Friends & Foes update also adds more ways to discover the lore of Rynoka. Now, when you visit dungeons at night, your trusty mentor Zenon will be sat by his campfire, ready to tell forgotten tales. Tomo’s stories have also been slightly adjusted to shed more light on her relationship with Will. 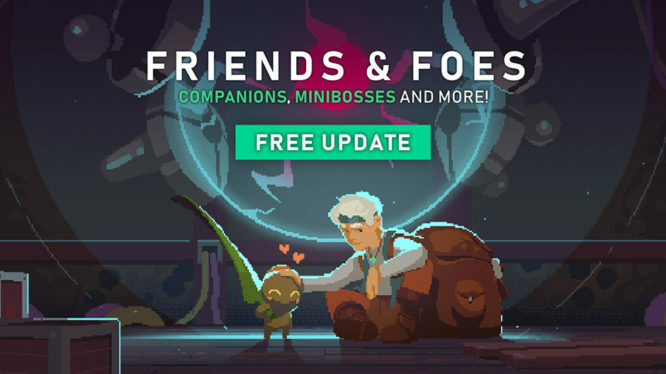 Moonlighter’s free Friends & Foes update is available now for all players on Nintendo Switch, PC, PS4 and Xbox One.